Danish PM: Shooting is 'terrorist attack' Jump to media player A shooting at a free speech debate in the Danish capital, Copenhagen is being treated as "a terrorist attack", the Danish prime minister says. Audio of Danish cafe shooting Jump to media player An audio recording obtained by the BBC captures the moment a gunman struck a free speech debate in the Danish capital, Copenhagen. Witness: 'I thought it was fireworks' Jump to media player An eyewitness to a gun attack at a blasphemy debate in Copenhagen describes how he thought the sound of gunfire was "fireworks" when it began. Gunman targets Danish blasphemy debate Jump to media player A manhunt for is underway after at least one person was killed and three police staff were shot and wounded at a free speech debate in Copenhagen. 'Masked gunman was shooting at police' Jump to media player Danish people "shocked" by shooting at free speech debate in which one person has been killed and three police officers injured. A shooting at a free speech debate in the Danish capital, Copenhagen, is being treated as "a terrorist attack", the Danish prime minister says. 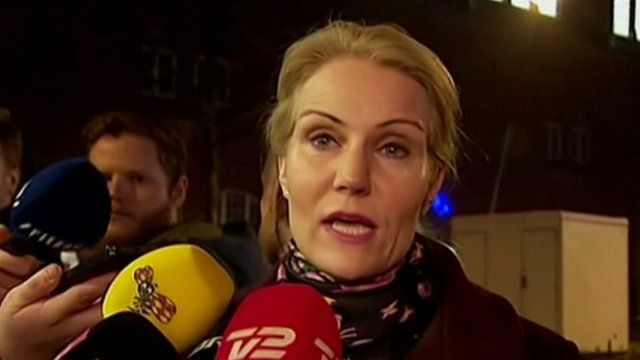 Helle Thorning-Schmidt said the attack was "politically motivated" and that the country was on a high state of alert. A manhunt is under way for a suspect who targeted the event at the Krudttoennen cafe in the Oesterbro district of the city. Controversial cartoonist Lars Vilks, who has drawn caricatures of the Prophet Muhammad, is understood to have been present at the debate.